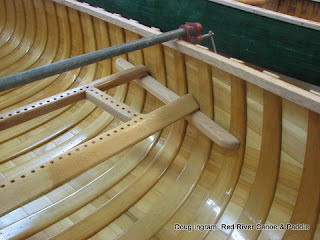 The new Boreal exterior sanded and treated with linseed oil. The Oil prevents the wood from drying out and getting brittle, and it reduces the amount of moisture that the wood can absorb. 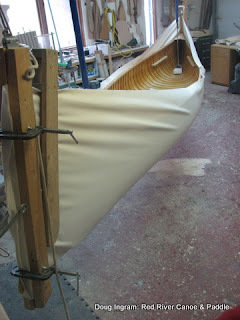 The seats on this canoe are supported on risers rather than being bolted to the gunnels. This allows them to be set lower and reduces the number of holes that get drilled into the gunnels. 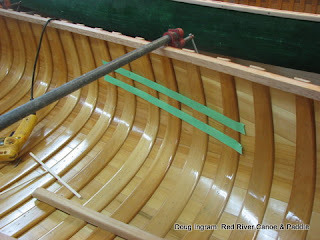 An important aspect of the installation is to get the risers at the correct height, level, and parallel to each other. 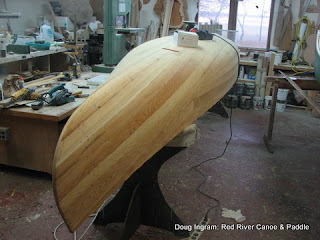 Here is how the risers and seat go into the canoe. Canvas went on Friday. 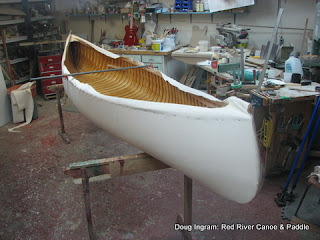 I ran out of time to get the filler on as the phone kept ringing with inquiries and people showed up to discuss their canoes. A sure sign of Spring! All done and ready for filler first thing Monday morning. Posted by Doug Ingram at 1:54 p.m.